ONE has an unmistakable Scottish brogue, while the other has an instantly recognisable London accent. Raised at opposite ends of United Kingdom they may have been, but when it comes to the art of defending, Barnsley’s twin peaks of Liam Lindsay and Ethan Pinnock come from similar schools. I would like to say I am the talker and he is the sweeper. He is a laid-back guy. We get on away from the pitch and that can only help as well. Subtle on-pitch differences may be detectable in style, but there is more commonality. Oakwell has witnessed some eminent central defensive partnerships over the years – with the early Eighties axis of Mick McCarthy and Ian Evans perhaps being the most fondly recalled – and the Reds’ present-day mainstays are doing their level best to be talked about in years to come. Both were recently at the epicentre of Barnsley’s recording of seven successive clean sheets, something that the club previously achieved in April, 1955. Over the duration of the 2018-19 season, playing a leading role in the amassing of 20 shut-outs, something that the Reds last achieved in 1984-85 under the late Bobby Collins, is further affirmation of the duo’s importance. As is Barnsley’s leakage of 33 goals in 41 league games, the best record in the EFL. By their own high standards, a concession of five goals in the Reds’ past two games represents a veritable flood, but the safe money is on Daniel Stendel’s side getting quickly back on message. If that is the case, expect the duo regarded by many – although those in Luton and Portsmouth may differ – as the best centre-back pairing in League One to have an emphatic say in that. Lindsay told The Yorkshire Post: “I think we complement each other pretty well. It is just a shame we are both left-footed, but I do not think that has stopped us. “We ignore it. This is our first season together really as we only had a couple of starts together last season and we have got to learn about each other. But I think it has been good so far. “We are not opposites, but Ethan has got more pace and can get more out of situations. “I would like to say I am the talker and he is the sweeper. He is a laid-back guy. We get on away from the pitch and that can only help as well. Lindsay’s well-being is in marked contrast to this time last year when Barnsley were in the midst of an unsuccessful fight to retain their second-tier status. It was the prelude to a summer which incorporated a fair few dark days of introspection, according to Lindsay – with a relegation on your CV and that of your club constituting a black mark. 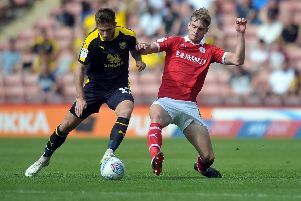 You sense that will only be erased if Barnsley return to the Championship at the first time of asking, with a players’ meeting, organised by the squad earlier this week to reassert what is expected of each other between now and season’s end underlining what it is at stake. Looking back, Lindsay acknowledged: “It (last summer) was a tough time. I blanked it out from my mind to be honest and do not want to think about that. “But it has made me stronger as a person and I am sure it made everyone else stronger. “It has been brilliant in terms of winning games most weeks. It is incredible how much it changes you as a person as well. It makes you happier. Further reinforcement of just what Barnsley are striving for has also regularly arrived from the reassuring voice of captain Adam Davies, the sole surviving member of the Reds line-up whose astounding charge in the second-half of a magical 2015-16 season ended in a joyous promotion. The experiences of Davies and company also act as a timely reminder of the fact that strange things happen at the tail-end of campaigns. It is something for Stendel’s troops to be mindful of – after dropping out of the top two this week with five games to go and be replaced by Sunderland with Portsmouth and Charlton also hovering dangerously in the vicinity of the second automatic promotion place behind Luton. Lindsay added: “Davo obviously was part of that promotion (in 15-16) and has talked about it. “I remember him saying that we were bottom of the league at one point and then went on this run. “If we get on a run of wins in the last five matches, I am sure that will be enough to do the job.